I regularly field Facebook messages and late-night texts or phone calls from people searching out their ancestors and hitting a rough spot or needing help figuring something out. I’ve been known to stalk my friends’ family trees just to find them a place to start on their family history. And in a recent fireside, President Featherstone said if you want to know something about family history, you just need to know two words: Liz Stitt. Talk about pressure! Now I would correct that and say those two words should be “Find cousins!” But nevertheless, it is true, I am a bit of a fanatic about family history work. There are worse things to be known for than spending a lot of time seeking out dead people. And it can be to your advantage because thankfully I found out Cam and Adam Poulter in this stake were my second cousins before I ever considered going on a date with either of them. So tonight I would like to tell you why I’ve got this fire and I pray that you will feel the excitement, power, and vigor from the Spirit. My message tonight is this: Find the joy in family history and cling to your covenants. and Joseph. And about Mary Magdalene. Now you may think you know this story, but most of you probably do not. 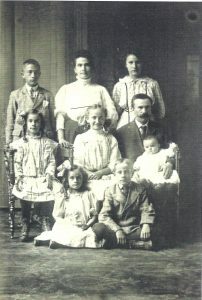 Mary and Joseph were Catholic emigrants from Slovenia whose adventures landed them in Salt Lake City, Utah in the early 1900s. They had a large family, the oldest of whom was my great-grandmother Mary Magdalene. Mary Magdalene grew up and married Carl Christian Larsen, a nice young man from a family of disaffected members of the Mormon Church. They became the parents of my grandmother, Lillian Clara Larsen. As a Catholic, my grandma swore she would never marry a Mormon boy. But in high school her best friend Pat—a member—started dating a great young Mormon boy named Paul. And Paul had a twin—Grant McEwan Cutler. Paul and Grant were enlisted in the Navy and when they came home on leave, Paul and Pat doubled and set Grant and Lillian up on a date. Then Grant returned to training. While he was in training, Grant’s life would change dramatically. His brother-in-law was killed in the war and then his best friend and twin, Paul, went missing on a flight training mission. Paul was never found. Grant’s father then died soon after due to a serious illness. As the only living male in the household, he returned home from the navy to a heartbroken family. Although he had been ordained an elder before entering the Navy, Grant was no longer very active in the Church. He started picking up the pieces of his life and moving forward, which included meeting back up with the beautiful young Catholic girl Lillian. They courted and were married in the Cutler home on Holladay Boulevard. Some years after their marriage, they moved in with my great-great-grandmother Marian Cutler—a very faithful and active Church member. She encouraged Grant and Lillian to go to Church. Largely because of Marian’s example, they began attending regularly, and the stake missionaries taught my grandma the lessons. My grandma felt the truth and because the missionaries weren’t bold enough, she called them and asked when she was going to be baptized. Soon after, my grandpa had the opportunity to baptize my grandma. My grandma was still growing in her testimony of covenants. 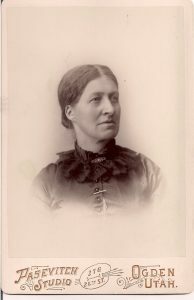 She was called as Primary president and served just as the new children’s songs “I Am a Child of God” and “Teach Me to Walk in the Light” were introduced. These songs touched her heart and she felt it was time for her family to go to the temple and be sealed. So in 1958, my grandparents were sealed together and my mom and her two sisters were sealed to my grandparents. They were sealed in the Salt Lake temple by Harold B. Lee. He took my mom and her two sisters into the Celestial Room of the temple and then told them that all three of them would be married in that temple one day—a statement that proved true. For my grandmother, these were the beginnings of a covenant path in her family. For my grandfather, it was a return to the covenant. For my mother, it was a beginning of understanding covenants. And when my mom was 13 she felt a need to seek out her ancestors and often rode the bus to the family history library to start researching—a fire in her that has never stopped burning. All this while, my great-grandmother Mary Magdalene was still in the picture. I don’t know exactly what she thought about my grandmother marrying a Mormon boy, what she thought of my grandma’s baptism, or what she thought when they were sealed. But I do remember my great-grandmother. She passed away at the age of 96 when I was 6 years old. I clearly remember her sitting in her designated chair every time I went to visit my grandma. As she got older, she would attend Catholic mass with her sister in the morning, and then go with my grandma to Sacrament meeting. She told my grandma the reason she didn’t join the Church was because she was just too old to change. I remember that a year after my grandmother passed away, my mom prepared the temple work for Mary Magdalene. This dedication to providing proxy ordinances for my sweet great-grandmother left quite an impression on my 7-year-old brain and may have been the first understanding of the importance of my own covenant path and the need to provide those ordinances for others. My mom taught me the importance of record-keeping and family history from a young age. And she showed me the importance of providing ordinance work in the temple for those who have passed on. And my little Catholic-turned-Mormon grandmother and reactivated grandfather never shied away from their covenants. My grandparents served 10 years in a sealing group in the Jordan River Temple. And then they were asked to serve as ordinance workers in the Salt Lake temple and served 10 more years helping others make covenants. These family members and so many others I haven’t mentioned today have provided a legacy of faith and an extraordinary example of clinging to our covenants. For me, the fire to do family history came as I helped my mother work on family history growing up. In college, I learned about research methods, sourcing, and historical contexts of genealogy. But at the time, family history was a lot more time consuming: searching microfilmed records was more common than searching online, FamilySearch as it exists now had not even been invented, and indexing was a relatively new idea. This makes me sound ancient—but the changes in technology have made huge strides in just the last 5 to 6 years! Then just a little over 3 years ago, I found a break-through census record that had just been indexed, showing me the name of her half-brother’s wife and children, whose work had never been done.. It was just over 3 years ago that I found on my own—without the help of my mother—my first entire family that I could take to the temple and do the work. My ancestor Sarah has been less bothersome to me since finding those records and completing the work.For example, for years, I constantly had the name of Sarah Stitt on my mind—my great-great-great-grandmother. I searched and wondered and waited and tried to figure out why she was so important to me. She had been baptized in 1873 in England and had immigrated to Ogden, Utah. Her family had been sealed in the Endowment House and she had done the work for her family members who had passed on. So why did her name keep coming to me? Why could I not get her off my mind? The number of records indexed and the ease of technology now makes it so that I can find a family member or two or seven who need work done nearly every week. Almost all of my family lines are full of pioneer members of the Church—and I am finding work to be done on those lines. The days where we thought everything had been done are gone. There are cousins and aunts and uncles and half-siblings and spouses who need their work done in family lines we’ve never thought to look before—and in methods we’ve never been able to easily research before. The time to work is now. And we all have work to do—I have not yet encountered someone who has “all their work done”. And we can help you find your loved ones. In the scriptures, there is one scripture that shows up in every canonized book. It is the promise, with some variation, that we hear in the Bible in Malachi (Malachi 4), the promise the Savior reiterated when he came to visit the Nephites (3 Nephi 25), the promise Joseph Smith recorded in Joseph Smith History, and the promise that is canonized as the earliest revelation in the Doctrine and Covenants section 2—this promise. “Behold, I will reveal unto you the Priesthood, by the hand of Elijah the prophet, before the coming of the great and dreadful day of the Lord. And he shall plant in the hearts of the children the promises made to the fathers, and the hearts of the children shall turn to their fathers. If it were not so, the whole earth would be utterly wasted at his coming” (emphasis added). I believe in the promise worded in Malachi that as we turn our hearts to our ancestors, they will turn their hearts to us. In fact, I believe our ancestors’ hearts are turned to us and they are just waiting for us to turn our hearts. Our ancestors are very much alive and excited for their work to be done. This is our covenant to work with them in bringing them the ordinances they so desperately want and need. This is not just part of our covenant and part of the plan—eternal families are the covenant and they are the plan. In April 2010, Elder Holland said, “Ask for angels to help you.” In another talk, he spoke of the power that those on the other side are given to help us in times of need. I believe in this in a very real way. I have felt the influence of my ancestors as I have sought out their names. Over the past year and a half, a wonderful couple from my hometown Phillip and Barbara Hale have served in South Africa helping members with family history. Every single week there was a story of a member who came in and said something like, “Last night my uncle came to me in a dream and told me he wanted his work done.” Or another who said, “My grandmother appeared to me in a dream and told me her name and when she was born.” Who can contest that? Angels are real. And they are anxious to make covenants. Let me close by sharing a very personal experience, which I felt prompted to share the moment I was asked to give this talk. I ask for your understanding and for your compassion as I share a part of this story, the details of which have only been shared with a handful of people, and which I will share only in part here. In a very real way, this past year, I have felt heavenly angels strengthening me. I have struggled with perfectionism for as long as I can remember. This past year seemed to pit me into deeper despair than I have ever been in. And just a few months ago, I was seriously questioning my reason for being and why I needed to live any longer if I just couldn’t get things right in my life. These dark weeks and even months were contrasted with many impressions, though. Every time I felt like I was no good, I was reminded of the names of my family members whose work had not been done. I was reminded of the books of family names that I had yet to work through and organize. I was reminded of the many people in our ward and stake who needed help finding and seeking out their family members. Was I still needed? “We need you” was the answering plea I heard from these angels anxious to make covenants. In response, I replied that I needed them too. I asked for my Father to let these angel family members come and help me. “Cling to your covenants” was the overwhelming impression I received from the Spirit. And then another clear impression: “You need help.” I finally admitted I needed intervention. I started to change things. I started taking better care of my health and exercising. And I turned to professional counseling which has been a major blessing in my life. What does this have to do with family history? I asked God to send me help and He sent angels—people whose hearts had been turned to me because I had turned to them. I felt encouragement from my grandmother who passed away a few years ago. I felt strengthened by those I performed ordinances for in the temple. I feel there is real and tangible help from thousands who have gone before us and who are rooting for us to stay strong and carry on. By doing my family history, I have forged a bond that in many ways has saved my life. In this year’s BYU Women’s Conference, Sister Wendy Watson Nelson, wife of President Russell M. Nelson spoke similarly on this topic. I know this is true. And it is all possible because we have a loving Father in Heaven and because we have a Savior, Jesus Christ, whose life, mission, and Atonement quite literally bind us to our families. I bear this testimony in the name of Jesus Christ, Amen. 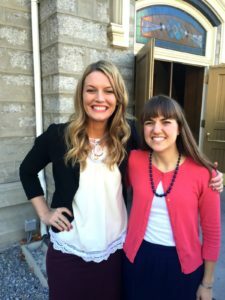 My roomie Emily Thatcher and I both had to speak at Stake Conference because we know too many people. We’re so happy because our talks are over.